Our older boys have been learning Spanish with Rosetta Stone software for three, going on four years. It has been fantastic! Asa was really able to use what he’s learning when he went to Ecuador this summer. We love it when these great skills can be applied to real life. Last week, Matt took advantage of a perfect teachable moment. 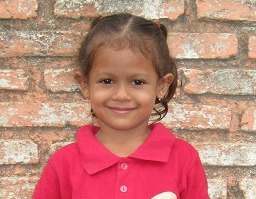 We received a letter from Gladis, the little girl we sponsor from Honduras through One Child Matters. It is written first in Spanish with help from Gladis’ teacher. Then it is translated to English for us to enjoy. I typically pull out the letter and start reading it to my family (in English, obviously). But Matt started reading it, one sentence at a time, in Spanish. The boys then got to have fun working together to translate it as he read. They did really well! It was a fun activity with our lunch, and hearing the phrases in Spanish made it seem as though we were getting to know Gladis more fully. I find it amazing that I can feel so connected and love someone so dearly even though we’ve never met face to face. Praying for someone will certainly do that for you! I’m very thankful for One Child Matters. Because of them, children’s needs are being met. Most importantly, these children are learning about Jesus and finding hope. While our family has the opportunity to bless this little girl, we are finding more and more that she is the one blessing us. I love how God works! What are you thankful for this Gratituesday? I’m thankful that we can come to God with all of our questions as often as we want. I’m thankful for short cat naps that I get in the afternoons. They give me just enough go-juice to make it the rest of the afternoon! Thankful to God for a change in my attitude today – my 3 mile run was helpful. Thankful that I can run 3 miles! Thankful for God’s providence and His grace and mercies which are new every day. What a wonderful thing it is when we think God is using us to bless others and they bless us in return! Today I am thankful for the time I spent planning our community outreach events for the next few months with my Pastor’s wife while my Pastor cooked us lunch. It was a simple, but wonderful day. Thank you for encouraging us to count our blessings, Laura.